When I teach a yoga class I’m often telling students to roll their shoulder blades back and down. This postural change makes for a relaxed, heart open, improved posture that goes a long way to removing the upper back pain most seem to encounter. Shoulders rolled forward like Smeagol is horrible. In Austin I see far too many computer warriors suffering from back pain that’s easily treatable. The back and down shoulder blade posture isn’t forced or contrived. Everyone and their spine/posture exists within a set of boundaries and parameters. There isn’t an aggression to the rolled back and down posture of the shoulder blades but most people, when they move this direction, will get a kinesthetic sense of what feels right when they go through the range of motion the shoulder blades allow. 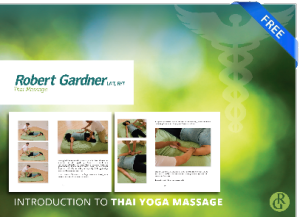 This simple Thai massage twist is an easy way to introduce the range of motion that the shoulder blade and spine will allow. This opens the chest, retracts the shoulder blade and allows the spine to rotate open on one side. This reminder can go a long way to helping introduce better posture by showing the client what feels good. Shoulder blades back and down feels free. Fly away, open. If someone feels uncomfortable feel free to move away from the lower back so the twist isn’t as strong in that area. If you perform this on someone make sure to get solid feedback. If there is any spine injury or former surgeries make sure to communicate and go slow, even someone with spinal fusion finds this freeing but make sure the movement isn’t sharp or jerky. Slow and smooth feels best and when in doubt, ask the person you’re working on how it feels. Shoulder blades, back and down..trust me.